Pucara Roxanne has been considered one of Pucara Allegro's best daughters. She has produced offspring that have been winners in the show ring and more importantly super strong genetics. San O comes from the most powerful genetic lines available in the U.S. His sire, Pucara Kahuna, has received top honors in show after show, and he has produced numerous offspring that have won awards show after show. 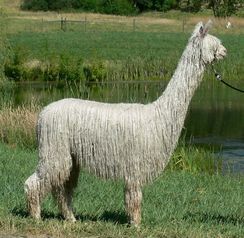 San O's dam is also a producer of great cria that also win in the show ring. The apple does not fall far from the tree here. This male has his own impressive show record. 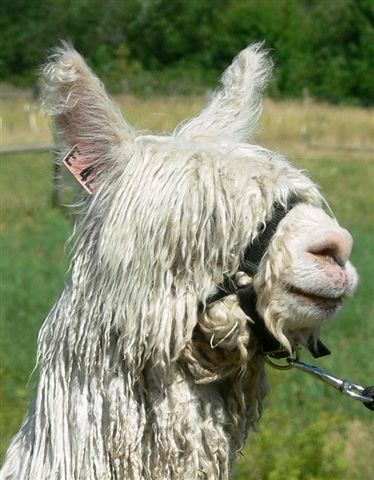 San O is a slightly taller male with the trademark knockout head style from Kahuna and the beautiful locking fleece style from the Allegro line. He exhibits very, very good lustre, fineness and a greasy slick handle. Good bone, upright, correct conformationally. San O is also a Trait Leader in the EPD Results. 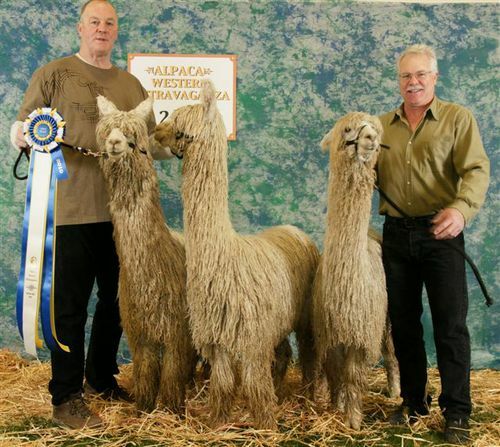 He has been ranked Number 1 for Mean Staple Length - Suri Male for both 2013 and 2014 and ranked number 4 in 2013 and number 6 in 2014 in the Fleece Weight - Suri Male category. We will be offering San O for breedings to select females in 2015. Call us for more details.